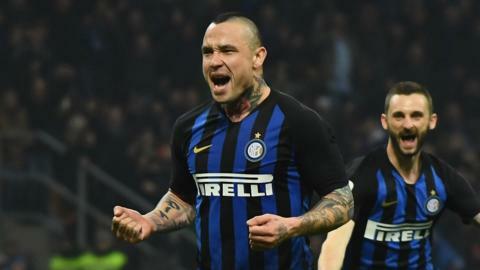 Radja Nainggolan scores the winner as Inter Milan beat Sampdoria to consolidate third place in Serie A.
Napoli's hopes of securing a first Serie A title since 1990 suffer a blow with a goalless draw at AC Milan. August's Genoa bridge collapse shocked a country. As the city's teams met on Sunday, there were tributes, reflections and tales of survival against the odds.